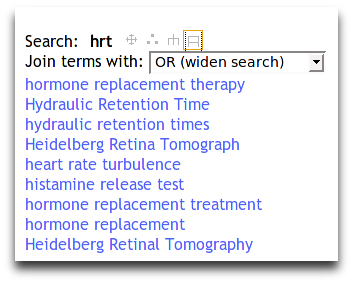 David Rothman reported on a case where a PubMed search for HRT wasn't expanded to match the MeSH term "Hormone Replacement Therapy", presumably because there are multiple meanings for the abbreviation HRT. The obvious thing to do in this case is to offer the most important expansions and let the user choose which one they mean, so that's what I've added to HubMed. Luckily, multiple groups have automatically extracted abbreviation look-up tables from MEDLINE abstracts in the last few years. One group even made the database - ADAM - freely available, so that's what HubMed's using (although the abbreviation server at Stanford might be even better...). It doesn't offer the abbreviations automatically for now - as with the other options for query expansion - so as not to slow down searches.